This Tuesday is Meals on Wheels Day. That means my Dad will get up early, drive over to the local church, load up his car with meals, and deliver those meals to people who are too old or too sick to care for themselves. Then he’ll hang out, lingering longer than usual. That’s really what my Dad does. He shows up, and then he lingers. One Christmas morning, maybe twenty years ago, I accompanied my father on his four-hour Meals-on-Wheels route. It only took us a week to finish. This Wednesday is Hospital Day. 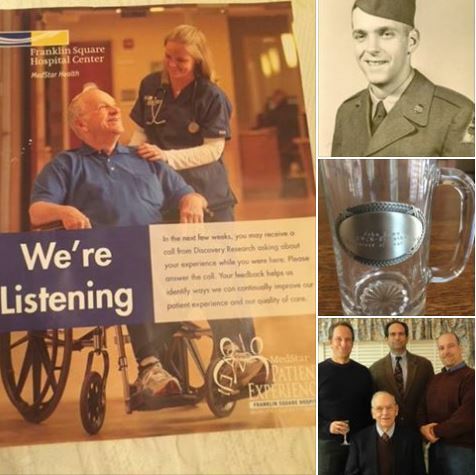 My Dad’s been volunteering at the local hospital for decades. Currently he’s in the ambulatory oncology unit, assisting cancer patients. He works there mostly as a nurse’s assistant, running to the lab to retrieve records, running to the pharmacy to retrieve medications, running to the laundry to retrieve warm blankets for patients who request them. As an 85-year old man with fallen arches, he doesn’t actually run, but he does step briskly, and with purpose. His main job though, is sneaking off after his shift and spending time with random patients. As an “Official Volunteer,” my Dad has easy access to a large and captive audience of horizontal residents, many of whom are desperately bored and lonesome. He seeks these people out. He talks to them. He tells them jokes and stories and listens to theirs. Then he lingers, longer than usual. Couple years ago, when the hospital wanted to advertise their services to the community, they needed someone to play the role of a patient in a wheelchair. Knowing my father had appeared in hundreds of plays over his long career as an amateur thespian, they asked if he’d like to pose for the photograph. After half-a-second of careful consideration, he said sure. My mother still has the photo on her refrigerator. She never thought she’d marry a model. Truth is, my mother is overrun with mementos commemorating my father’s penchant for volunteerism. Last time I was in their condo, I saw a glass and pewter mug that says, “Volunteer of the Year,” along with countless hats, jackets, tee-shirts, tote-bags, insulated carriers, mittens, fountain pens…a bottomless supply of swag from organizations grateful to have at their disposal a man always shows up, and always lingers longer than usual. As for the sons he raised, and the woman who changed her name to his – our gratitude is no different. Just deeper.